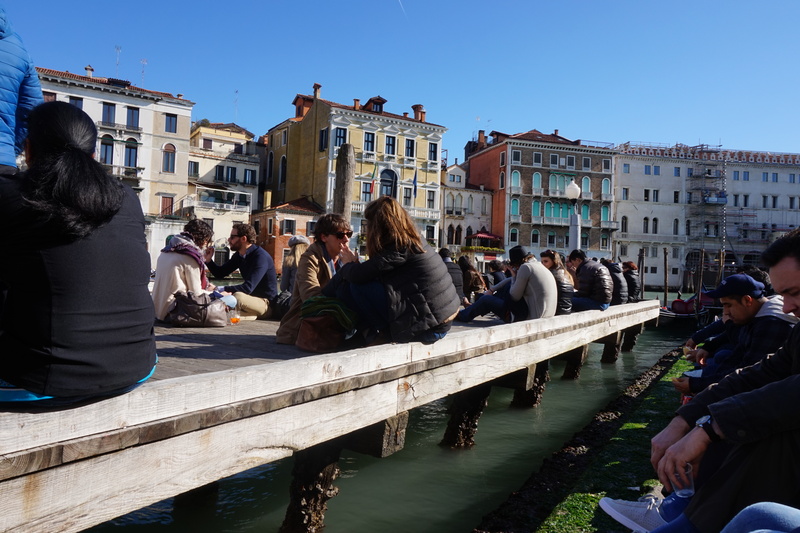 Venice is one gorgeous place – you can walk around for hours and not get bored. Stumbling upon the cubby holes selling €1.50 Prosecco is a highlight! The place is definitely romantic, but going as a girlie group would be just as great – €1.50 glasses of Prosecco is all I have to say here, really. The food is fab, especially the little tapas bits you can find at the cubby holes. Cheap & cheerful. Before we went I was warned of the extortionate prices, but if you’re clever you can find some great hidden gems..
One of those fabulous cubby holes is Al Mercer! 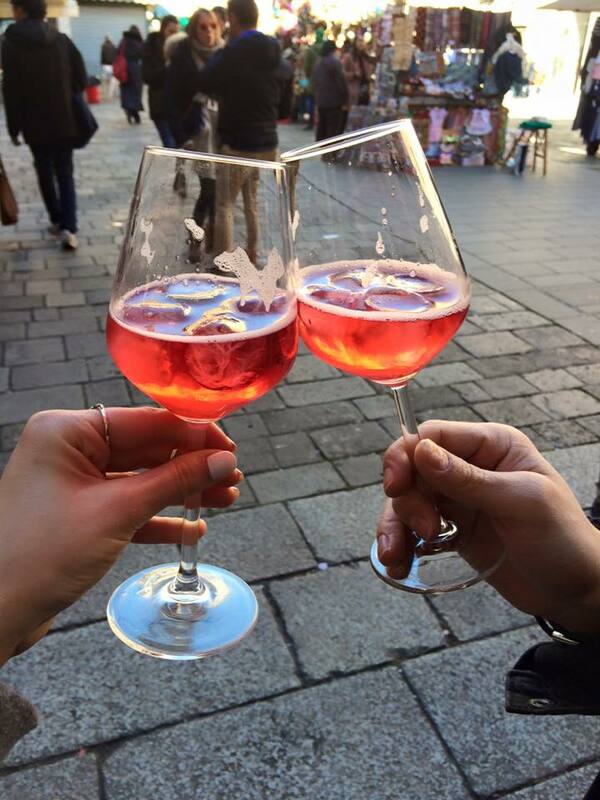 Close to the Rialto Bridge and serving great wine, prosecco & Spritz all at around €2-€3.50. Every local is drinking the Venician aperitif, Spritz. A mixture of liqueur, soda and prosecco. Aperol is now becoming popular over here but for all you dry white wine drinkers, Select is the way forward! A less sweet version – many serve this with a green olive. You can take this down to the pontoon and sit by the water whilst sipping wine, eating fresh fish and basking in the Italian sunshine. Just around the corner to this is the next fabulous surprise in the wall, Osteria Bancogiro. The wine is of a similar price but they have a restaurant tucked upstairs – although we didn’t try it we did have some of their cicchetti (Italian tapas) bites and these were delish! When the sun went down we ventured down the side streets to find somewhere traditional and cheaper to eat (avoid anywhere touristy! Super pricey!) Our favourite meal was at Osteria Al Diavolo E L’acquasanta – a super cosy, traditional restaurant full of locals. 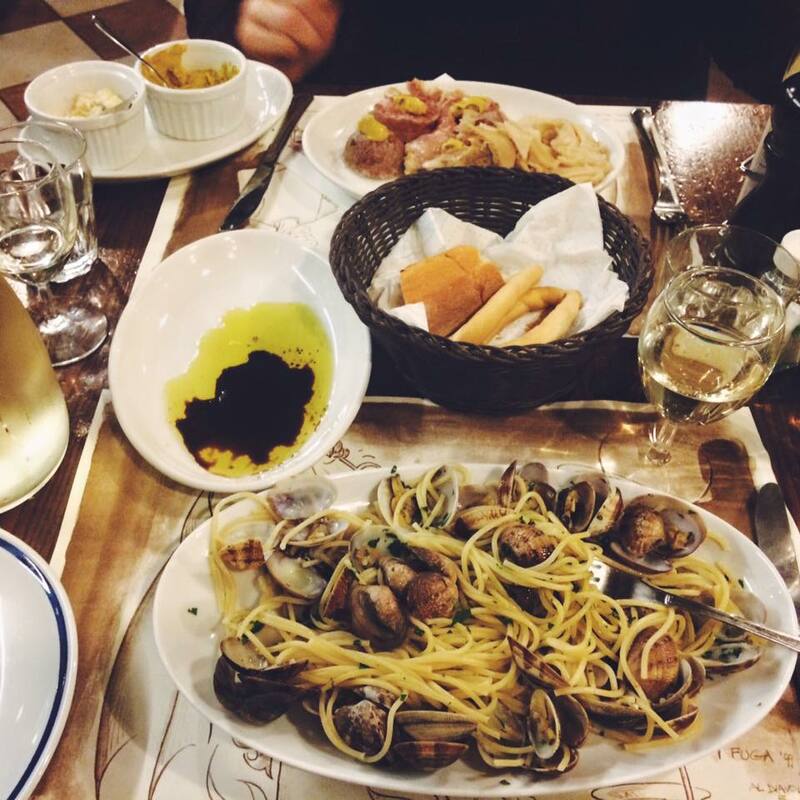 I had Spaghetti Vongole washed down with prosecco, 1.5L for €15…can you see a theme here? Although we didn’t eat by the Grand Canal or in St Mark’s Square, you can’t deny the atmosphere. 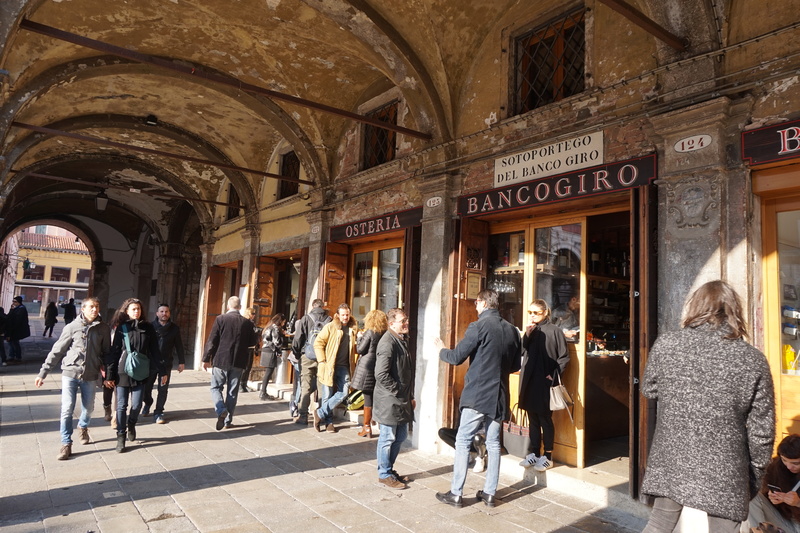 Experiencing the local, traditional places is my favourite thing to do but you have to enjoy the areas Venice is famous for. We enjoyed a coffee at Florian, the worlds first cafe and sipped on a bottle of red on the Grand Canal, under the heaters, cuddled in a blanket. Complete bliss.